As North Carolina decision-makers explore ways to expand Medicaid and close the state’s coverage gap, some have proposed requiring beneficiaries to pay a monthly premium in order to maintain their coverage. Given the economic realities facing those living without health care coverage, as well as other states’ failed experiments, it is clear that requiring premiums of Medicaid expansion enrollees would create major affordability barriers for North Carolinians who stand to gain health insurance coverage. 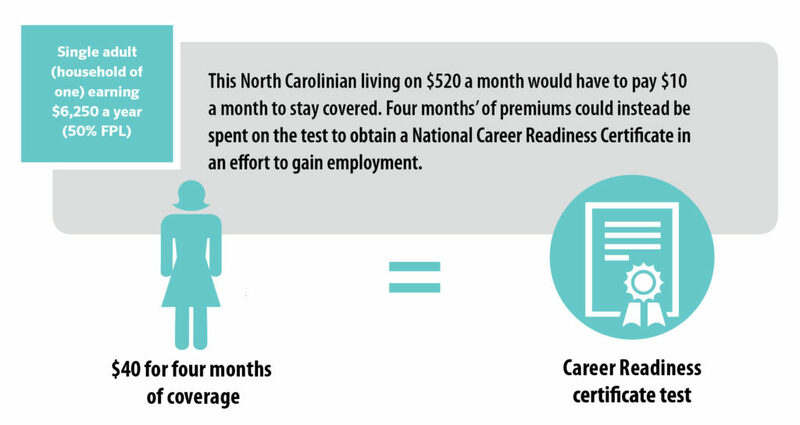 North Carolinians who would benefit from expansion earn incomes that are already insufficient to cover their monthly household budget costs for housing, food, child care, and other necessities, leaving little to nothing to pay for health care. The evidence from other states is clear: premiums create barriers to health coverage and care for individuals with low incomes due to their inability to pay. When people lose Medicaid because of premium requirements, it reduces their ability to access health care and puts an even greater strain on already limited household budgets. If lawmakers impose premium requirements on new Medicaid enrollees, a significant coverage gap will remain. People with low incomes will remain uninsured due to premium costs, leaving too many North Carolinians unnecessarily uninsured and unable to treat their health conditions. 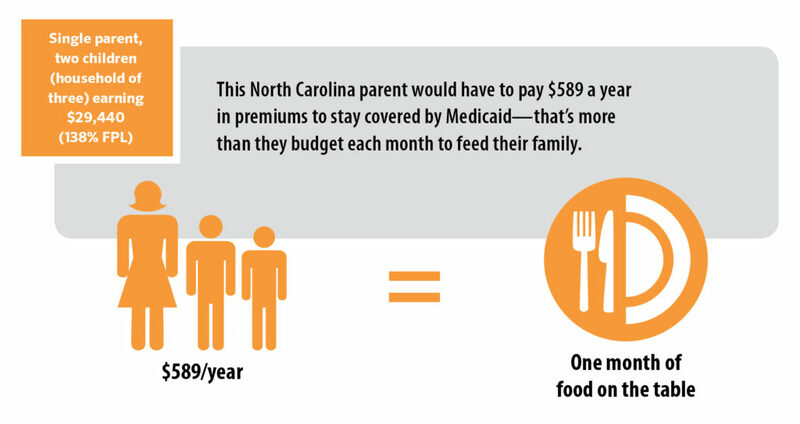 The North Carolinians who would gain eligibility under Medicaid expansion live in households that earn very low incomes. Under the state’s current eligibility rules, parents with incomes below roughly 43 percent of the federal poverty level (FPL) are eligible for Medicaid.2 Adults without dependent children are ineligible for Medicaid no matter their income. This restrictive eligibility leaves those whose incomes are too low for private market subsidies in a coverage gap.3 Closing the coverage gap would extend Medicaid eligibility to all adults ages 19-64 with incomes up to 138 percent FPL.4 To translate this into dollars and cents, a parent with two children earning up to $29,440 a year would become eligible, as would a single adult earning up to $17,200 a year.5 Under today’s restricted eligibility system for full Medicaid coverage, that same parent in a family of three cannot qualify unless their income is under $8,004 a year,6 whereas the single adult cannot qualify no matter how low their income. To charge premiums for Medicaid ignores the realities faced by households living in and near poverty. 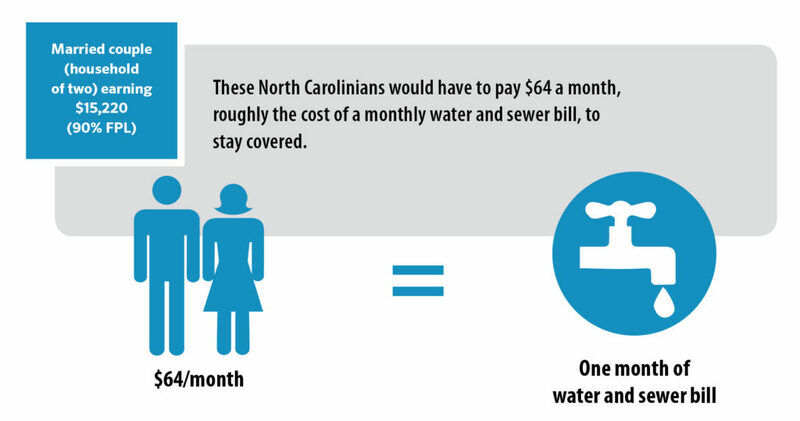 By definition, North Carolinians living in the coverage gap earn low incomes, and low-income households spend a far greater share of their earnings on the most fundamental necessities, such as housing, food, and utilities.7 The additional expense of Medicaid premiums would further limit their ability to make ends meet and would result in many foregoing coverage. 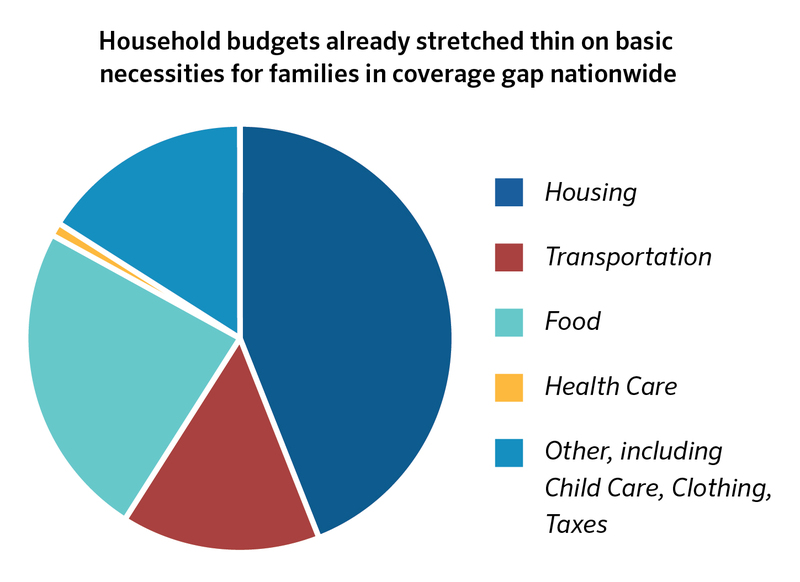 Data from the Consumer Expenditure Survey shows that, nationally, people living below 138 percent FPL and enrolled in Medicaid remain cost burdened without flexibility for major household expenditures like child care. These data show that even with affordable health care coverage, incomes at this level cannot meet the needs of households striving to get by. 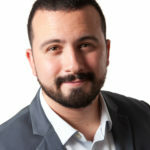 Households pay on average 44 percent of their annual income in housing costs,8 well above the 30 percent standard for housing affordability.9 These high housing expenses, in addition to other basic needs, leave no budgetary room to meet child care payments, an increasingly significant portion of family budgets. This leaves households cost-burdened and unable to achieve a level of financial stability that can support economic mobility, child well-being, and greater participation in economic and community life. In North Carolina, the data clearly show that low-income households are struggling to make ends meet. 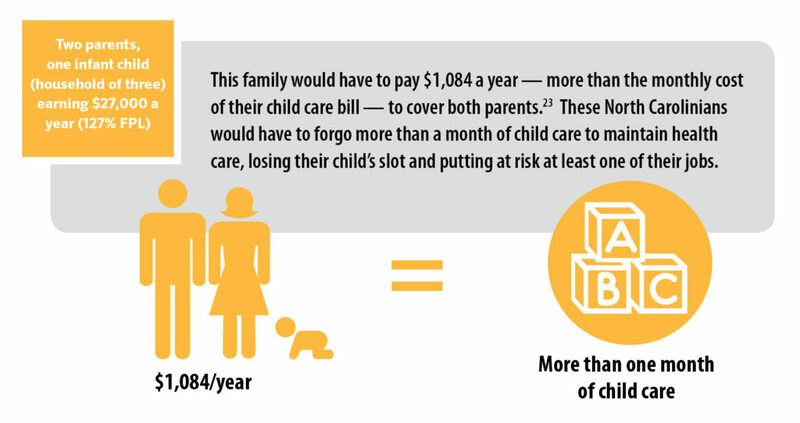 According to analysis by the North Carolina Budget & Tax Center, the average family of four needs to earn $52,946— well above the income eligibility threshold for Medicaid expansion — in order to afford the basic expenses of living in North Carolina.14 This is fully $17,411 more than the 138 percent threshold for a family of four that would be newly eligible under Medicaid expansion. household incomes of North Carolinians remain slow to recover from the damage of the Great Recession and to keep up with the rising cost of the basics. 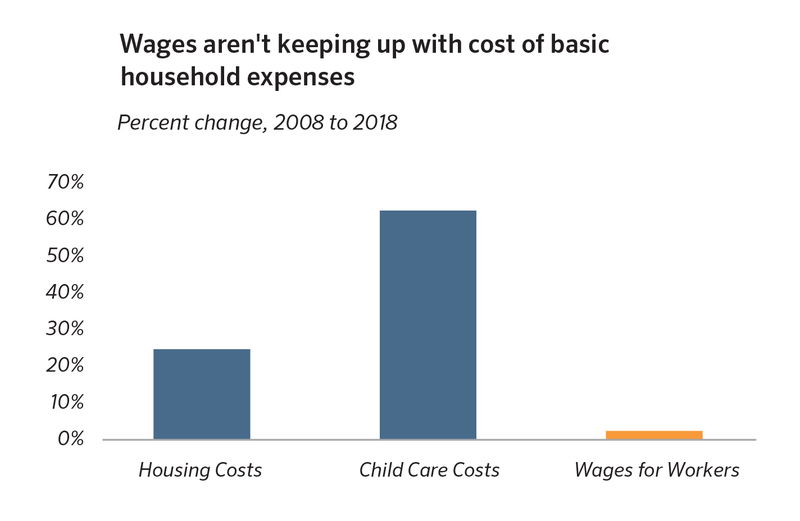 Indeed, the wages for workers in the 30th percentile of the distribution, whose average annual income would be $27,000, have grown by just 2.4 percent since 2008, when adjusted for inflation.15 This is far below the growth in housing and child care costs, which is placing a squeeze on households attempting to keep a roof over their heads and remain engaged in the workforce. 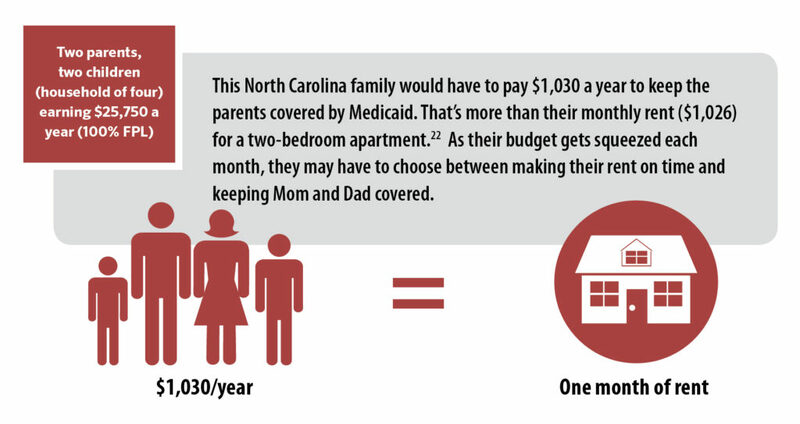 Outside observers have described premiums under Carolina Cares as “modest,”19 but the following household scenarios illustrate that a premium worth 2 percent of income can add up a lot, especially to low-income households with little-to-no income remaining after expenses on housing, transportation, food, and other basic necessities. Generally, the Medicaid program does not permit states to charge premiums to enrollees with incomes below 150 percent FPL. Despite this, several states have sought permission from the federal government to waive these restrictions in order to experiment with charging premiums to Medicaid enrollees with much lower incomes. Premiums create barriers to both obtaining and maintaining Medicaid coverage for individuals with low incomes. Creating or increasing premiums for enrollees in Medicaid and the Children’s Health Insurance Program (CHIP) reduces coverage overall, leading to enrollees losing coverage and deterring eligible individuals from enrolling in the first place. Negative effects of premiums are more pronounced for households with lower incomes, especially those living below poverty. Among enrollees subject to premium requirements, those with lower incomes were more likely to become uninsured. While ample research supports the conclusions above, only a handful of states have experimented with premiums for Medicaid expansion enrollees (adults ages 19-64 with incomes below 138 percent FPL). Across those states, large swaths of enrollees are missing payments. The Carolina Cares proposal shares a number of similarities, including the 2 percent required contribution and 60 day grace period, with the Indiana program. However, the premium requirements in Carolina Cares could lead to even greater shares of enrollees losing coverage in North Carolina than those in Indiana. Unlike under Indiana’s program, enrollees with incomes below poverty could lose coverage entirely under Carolina Cares if they miss premiums. Nearly 60,000 Hoosiers with incomes above poverty were denied coverage after missing premium payments, but the 37 percent of Indiana enrollees below poverty who missed premiums were not terminated — they are instead given coverage that covers fewer services and with higher co-payments.30 Similarly situated North Carolinians would lose coverage under the Carolina Cares proposal. No single other state has gained federal approval to take Medicaid coverage away from enrollees with incomes below poverty for not making premium payments. All in all, the evidence is clear: premiums create barriers — both administrative and financial — to health coverage and care for individuals with low incomes. When enrollees lose Medicaid because of premium requirements, it reduces their ability to access health care and puts an even greater strain on already limited household budgets. Medicaid expansion provides North Carolina with a tremendous opportunity to draw down billions of new federal dollars and provide health coverage to hundreds of thousands of uninsured people. Given the 90 percent federal match on Medicaid expansion enrollees, our state would benefit from maximizing enrollment. The more people enroll, the more federal dollars come into the state, in turn generating economic activity, creating jobs, and producing fiscal savings for the state budget. Any proposal that erects barriers to enrollment would limit these benefits. Ample evidence from other states makes clear that requiring premiums would create administrative hurdles and affordability challenges for North Carolinians with low incomes in need of health coverage. 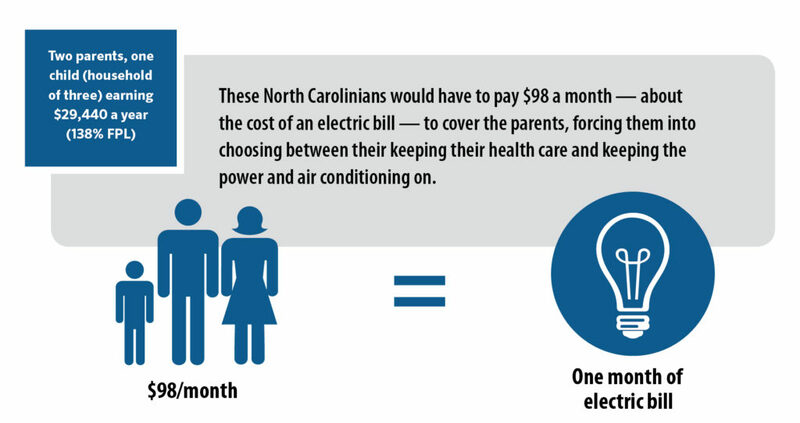 Instead of charging unaffordable premiums that unnecessarily take coverage away from people in need, lawmakers should design a proposal that will maximize federal funding to cover the most North Carolinians eligible. At the end of the day, our state will not fully close the coverage gap if lawmakers charge premiums to North Carolinians who become eligible for Medicaid expansion. Khatchuturyan, S. Financing Health Care, BTC Report: NC Justice Center, Raleigh, NC. March 2019. Bureau of Labor Statistics, March 2018, The effects of rent burden on low income families. Accessed at: https://www. bls.gov/opub/mlr/2018/beyond-bls/the-effects-of-the-rent-burden-on-low-income-families.htm and Desmond, Matthew, 2016. Evicted: Poverty and Profit in the American City. Health Coverage or Food on the Table?